If you haven't planted your okra yet don't worry. You still have plenty of time to get them started and producing before the end of summer. They'll grow nice and healthy as long as you keep them watered. The love the heat. 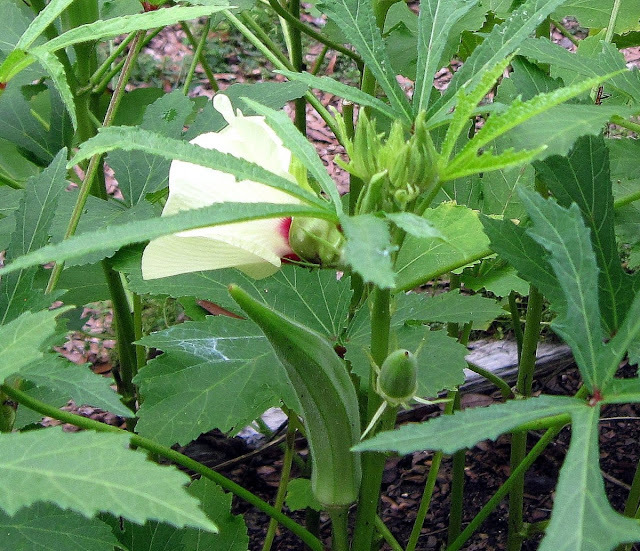 If you've never tried okra this is the year to do so. You can enjoy them in soups, pickled, fresh, fried or any other way you want to eat them. Being in the south I wouldn't be normal if I didn't like fried okra. You can fry them whole or cut up but either way they're pretty good. You can dip them in ranch dressing if you like or catsup. We made tamales some time ago and were trying to remember exactly how long you're supposed to steam them for before taking them out. When we did it last we had some expert help, not Rachel Ray or Guy but an actual Hispanic friend who had been making tamales for her entire life, or at least as soon as she was able to roll them. Among the myriad recipes they all seemed to be saying to steam the tar out of them (upwards of 2 and a half hours) until they set in the pot. Way back in the day this is exactly what my wife had done and the result was very flavorful water and tasteless tamales. This is not the way to do it. The millions of innocent trusting web browsing individuals out there will find hundreds of sites saying it is and I can only hope that they will find this post and sigh with relief as they realize it isn't that hard. You can use whatever filling you want as long as it isn't soupy. If you can wring liquid out of it by squeezing the filling in your hand, not a death grip but handshake hard, then it's too wet. If it's too wet add some more meat. the meat needs to stick together somewhat though so don't make it too dry either. You will need to soak corn husks until pliable. Use about 6" wide husks with the ribs of the husk up and down. Tear off extra if needed. If it's too narrow then all you can do is toss it or tear it into strips if you want to tie the tamales for cooking (not absolutely necessary but doesn't hurt, we lost two last time because we skipped this step). Remove the husks from the water before you start. You don't want them wet, just pliable. To make about 4 dozen tamales you need 3 lbs. of prepared masa. We used 2 whole chickens and made a verde sauce for the filing. We had enough left over for a sandwich. To the masa add 1 cup or lard or shortening and 1 1/2 cups of broth. Mix until it's all incorporated. You can use your hands if you want to and unless you got a masa spreader you'll probably be using your hands to spread it anyway. After you have your masa and filling ready, take the husks (dry but pliable) and spread the masa on from one edge to about 1 1/2 - 2 inches from the other side about 1/8 inch thick. Leave room on top and bottom for folding. Add filling which will cover about a third of the masa in the middle length wise. Roll up the meat in the husk from the side with the masa on it toward the other edge of the masa so that the remainin husk wraps around the tamale. Fold in the top and bottom and set on a tray folds down. At this point you can tie the tamales so they don't open with corn husk strips. Do this over and over until you're out of masa. Carefully place the tamales in a tamale cooker and fill the voids with ceramic bowls or cups depending on the gaps. Don't pack too tightly but make sure the tamales are standing up. It may be best to put them in the pot when the pot is on it's side and funnel water to the bottom of the pot afterwards. Here's the important part! On high get the water boiling. After the water starts to boil, steam the tamales for about 30 minutes. Don't over cook. Remove from the heat and let sit for a couple minutes so the steam can leave the pot before putting your hand in there. Remove the tamales from the pot and let them sit on a tray for about 20 - 30 minutes to set up. They will set up after being removed so don't worry about the texture immediately after removing them. If all goes well you will have some pretty dull water and flavorful tamales.